Mapcoords displays your current coordinates on the minimap. Ended up making a rogue using class trial to test this, but I found a solution and fixed the problem in this addon. Last edited by SDPhantom : 10-29-16 at 04:12 AM. Just for my own sanity I installed this as my only addon and ran the same tests from my second last post in this thread with the same results. That doesn't look like any part of this addon. You might be mistaking for MapCoords by Jim-Bim. 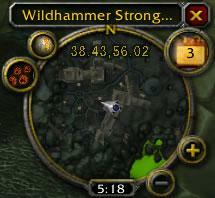 This is an almost 9-year-old minimap coordinate display. Last edited by Tonyleila : 10-19-16 at 08:42 AM. Some Changes that i have made. I think it looks better. The first one was just a matter of personal preference. I stuck it wherever it would be out of the way and didn't look too cluttered. Everyone is free to change it to wherever they wish to have it. The second one was to include the decimal precision to some point. A lot of the older coordinate addons have no decimal precision while some newer ones only have it to 1 place. The example original code displays a decimal precision of 2 places which is adequate enough to measure a character's movement down to a single step. Adjusting this precision is as easy as changing the "2" in "%0.2f" to how many decimal places you want it to display.